Love him or hate him, it’s impossible not to respect Kenny Chesney. Here’s a guy who didn’t embark on a music career until he was college age, who’s kinda short and slight and prematurely bald, who decided what he wanted and went out and got it, and has only improved along the journey. He left rural East Tennessee and took on the odds and beat ‘em, as if he were destined to win all along. So, while Chesney’s latest release, Hemingway’s Whiskey, doesn’t really have any big surprises, it’s one more notch on the belt of someone who, as everyone is finally figuring out, isn’t going away. This record pays homage to Nashville’s songwriting community, whether that was Chesney’s intention or not, since he only co-wrote one of the songs himself (“Reality,” with Brett James). It’s certainly not the album’s best number, but this up-tempo song of escape from everyday life may well be the album’s next single. 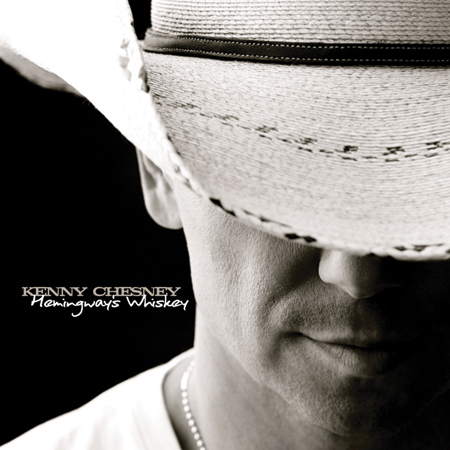 The rest of the album features songs tailor-made for a Kenny Chesney album written by many of Nashville’s finest. The Casey Beathard/Dave Turnbull radio hit “Boys Of Fall,” celebrating the role of the gridiron in small town USA, opens the album, and what strategic timing it was for this song to be released just before football season. Chesney duets with Vermont bluesy soul-rocker Grace Potter on Matraca Berg and Deana Carter’s “You And Tequila,” and also sings with country icon George Jones on Bobby Braddock’s “Small Y’all,” which Jones himself cut back in the ‘90s. The high points of the album are J.T. Harding and Shane McAnally’s excellent “Somewhere With You,” which takes us on a familiar trip of two lovers searching for themselves; and the Lee Brice/Billy Montana/Jon Stone co-write “Seven Days A Thousand Times,” a universal tale of temporary love that wasn’t meant to last more than a few days, a la “Anything But Mine,” but a couple levels deeper. Other writers on the album include Paul Overstreet, Scotty Emerick, Neil Thrasher, and the great Guy Clark, one of the co-writers of the title track and the original recorder of it. Co-produced by Chesney and longtime associate Buddy Cannon, Hemingway’s Whiskey is alternately mellower than Chesney’s previous offerings, and heavier than past recordings because of harder and louder guitars in the mix. Hemingway’s Whiskey doesn’t really break any new ground, but it’s a solid effort from Chesney that is sure to please his existing fans and maybe gain him a few new ones.